Keith, I just love it!!! Great shot. Rick wants to know if the pig in the front was yours? Thanks, we had a fun day at the fair. No, the pig wasn't ours. Rebecca's family only raises cattle on the ranch, no pigs. Since red is Evan's current favorite color, he was rooting for that pig in front! 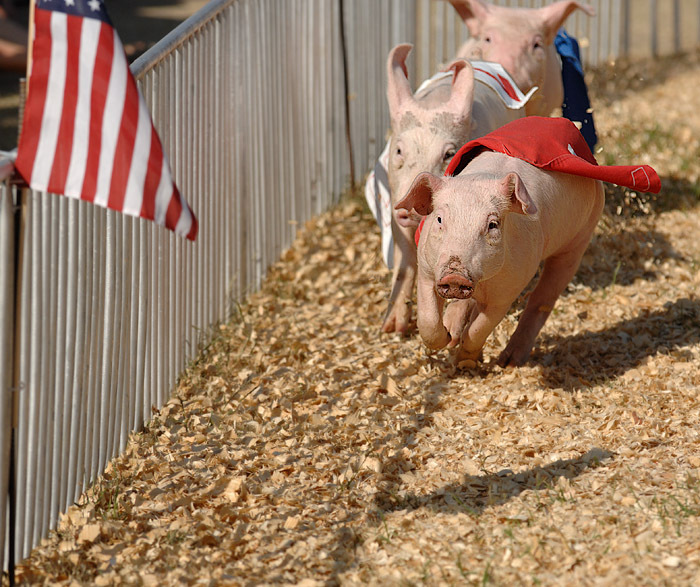 The pig races were a hoot. It was a little horse shoe shaped track and they started in little gates like a horse race. The minute those gates opened, those pigs just shot around that track to the pan of feed at the end. The announcer gave the name of each pig (a play on a celebrity name like 'hamma Montana' and got sections of the crowd cheering for each color. Very funny.